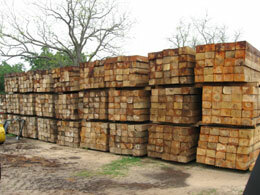 Hardwood skids are used for cribbing, racking, and elevating pipe used in pipeline construction. This was our first product when Pipeline Skid Service started in 1953, and with mills all over the United States. We probably have some in inventory near you. Our Hardwood Skids come in full cut, nominal, and ½” shy sizes, and are constructed from the hardest woods available including oak, hickory, and elm. We can also provide all oak or no bark skids to meet the specifications of your particular job.